A ground-breaking campaign using pioneering digital out of home and design technology to protect Africa’s remaining elephants launched in Hong Kong on Thursday, March 23 before moving to New York and Britain (today). Brands including Maclaren, BCD Travel, National Express and Givergy will lead #MarchforGiants, a virtual parade of 3D computer-generated elephants. Each brand’s donation protects an elephant for life. Within first few days of the launch campaign alone 1,500 members of the public donated and created their own elephants to join the herd – the actors Anna Friel, Elizabeth Hurley, Ricky Gervais and Joanna Lumley are among the celebrities who have given their support to the campaign. 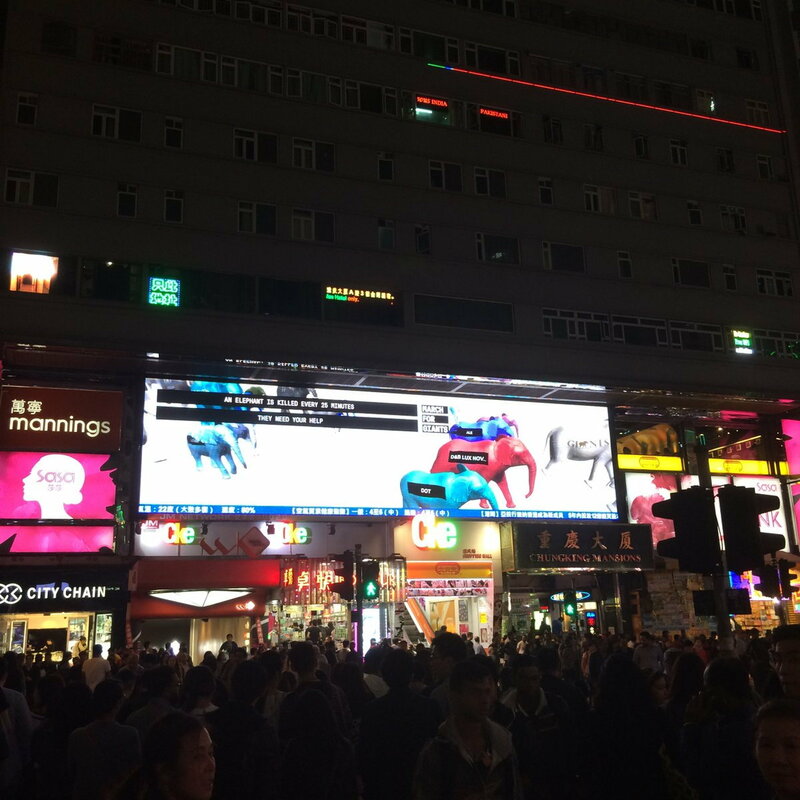 Created online, the virtual herd will appear on large format DOOH screens across the world operated by Ocean Outdoor and its Global Alliance partners. It is the first time state-of-the-art digital design technology has joined with global advertising might to create a charitable event that circles the world from Asia to the Americas to Europe, illustrating the urgent need for a global response to the threat to Africa’s elephants. #MarchforGiants was a winner in Ocean Outdoor’s annual creative digital competition which fosters advances in digital out of home campaigns. The herd begins its four-day journey on the CTV screen at CHUNGKING MANSIONS in TSIN SHA TSUI at 7pm on Thursday, March 23. From there it moves to Times Square in New York to continue its night-time procession, and then to Westfield Stratford City London, Birmingham, and Manchester on the morning of March 24, 25, and 26. As the march unfolds, companies and supporters can create their own elephant at www.marchforgiants.org to join the herd in real-time as it marches across the screens. Max Graham, CEO of Space for Giants told us “March for Giants is a global campaign but it was important to us that it kicked off in Hong Kong, where there is such a groundswell of support to end the ivory trade to help end poaching”. “China and the Hong Kong authorities are leading the way with the ban on the ivory trade that comes into force at the end of this year, and all of us working to protect elephants celebrate that ban. But it does not mean the end of the threat to Africa’s elephants, far from it”. #MarchforGiants is created by creative agency 18 Feet & Rising, which drew upon technical and digital teams spanning advertising, 3D digital design, gaming development, instant-share image creation, cross-border charitable payment and animal science. Will Thacker, Creative Director at 18 Feet & Rising said “We knew we needed to create something digitally cutting edge to really capture the public’s imagination. By donating to March for Giants brands and the public alike can create their own bespoke elephants, a unique chance to become part of the story, and follow it socially as it unfolds across the globe”. Technical support throughout the march is provided by DOOH.com, Popped and Freefolk. All of the funds raised will go to Space for Giants, a Kenyan based conservation charity that works to protect Africa’s remaining 380,000 elephants and the landscapes on which they rely. It is already well on its way to its goal of safeguarding half of those elephants by 2020. Poachers, mostly supplying Asian demand for ivory, killed close to 145,000 elephants across Africa in the seven years to 2014, reducing the overall population by a third. That equated to an elephant being killed every 25 minutes every day of every year from 2007 to 2014. This entry was posted on Thursday, March 23rd, 2017 at 13:45 @615 and is filed under DailyDOOH Update. You can follow any responses to this entry through the RSS 2.0 feed. You can leave a response, or trackback from your own site.